Maternal healthcare is part of the health security guaranteed under the National Health In-surance (Jaminan Kesehatan Nasional, JKN) to improve maternal health in Indonesia. The ob-jective of this health security is in line with the UN’s vision of sustainable development (Sus-tainable Development Goals) which is to ensure equity of access to health services for every woman. Although the JKN program has run for four years, the health status of pregnant women in Indonesia has not experienced significant progress. 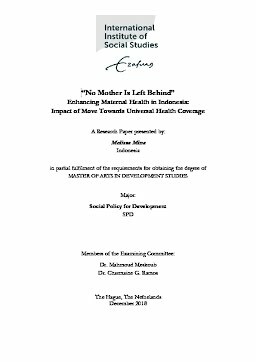 This thesis aims to examine and evaluate the pattern of maternal healthcare used by JKN users in 2017-2018. The study uses qualitative descriptive methods by conducting individual interviews with 17 respondents consisting of JKN users and non-JKN users, health workers, BPJS Kesehatan’s staff, and expert staff from government agencies across Indonesia. Based on the interviews, the study identified that the variable utilization of maternal healthcare has a close relationship with the capabilities and availability of resources from the health care providers. The results of the study found that only 4 out of 10 women who hold JKN used the whole maternal healthcare. The most frequent obstetric service used by JKN holders is delivery services. The factors that influence the preference of users to conduct antenatal care of JKN are the extensive availability of the primary health care facilities and the quality of medical personnel in health facilities. Also, the dissemination of information on the mechanism of the JKN program in general and the type of maternal healthcare covered by JKN play an important role in increasing public understanding of social security and maternal and child health, especially for low-income communities in rural areas. The results of this study can be a useful resource for BPJS Kesehatan, health service providers and health professionals to improve the quality of JKN maternal healthcare services.